Making a Difference | TFI Envision, Inc.
Norwalk, CT — “As if trying to get a grassroots group off the ground isn’t daunting enough! Thanks to the supremely talented group at TFI Envision, Skip the Plastic Norwalk’s visual identity is first-rate: polished, professional and impactful. What’s more, it works digitally, across all social channels, as well as on a variety of printed pieces TFI Envision’s team has created to date, often on a tight schedule. The visuals are so outstanding, in fact, a similar environmental group asked if they could use the same graphics as Skip the Plastic Norwalk. 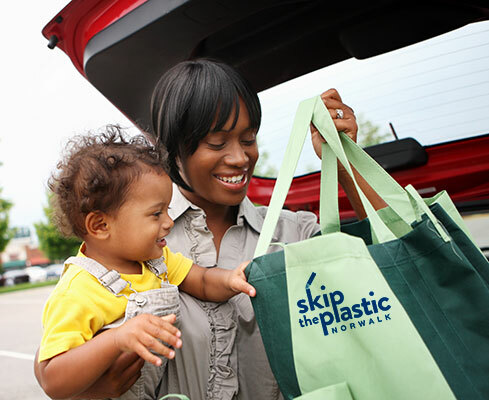 People are paying attention to Skip the Plastic Norwalk’s message because its visual identity is truly exceptional—no small accomplishment in today’s crowded, noisy digital landscape.” said Ann Magnin, member of the Skip the Plastic Norwalk team.